Earn $6.39 in VIP credit (639 points)What's This? 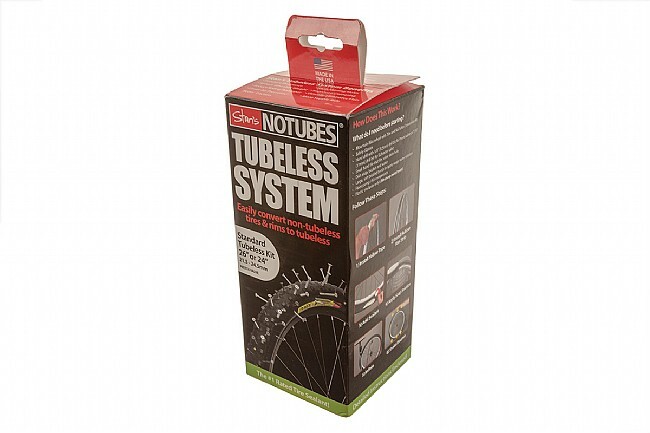 Go Tubeless with Stans NoTubes. 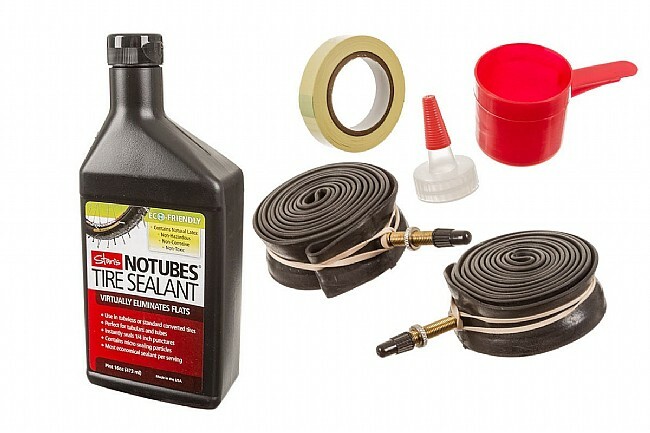 This Kit converts a standard 26 Inch mountain bike rim to tubeless compatibility. Going tubeless is lighter than using a tube, prevents pinch flats, and allows lower tire pressures for increased traction. Using the included sealant, punctures of up to 1/4" are quickly sealed. The sealant is made with natural latex and is Non-Hazardous, Non-Corrosive, and Non-Toxic. Compatible with most cross country rims from 21.5mm to 24.5mm wide. The rim strips were too wide for my rims, so I just used the tape, sealant and valve stems to set up tubeless. It works great, but the kit doesn't come with the stems so you'll have to shell out some additional money for those. However, going tubeless is awesome. For big volume tires, (2.4 Conti X King & Mountain King), I was able get a more supple ride with the same pressure, but less sidewall flex in the corners. Traction is also greatly improved. Great stuff, seals well. Be sure to shack and pour inverted using spout, so you get the suspended sealing particles in your tire!